used for delaying the effects of ageing. This new dietary supplement Carcinine is the result of our continuing drive for innovation. At the cutting edge of supplement research, this product is a new derivative form of carnosine. 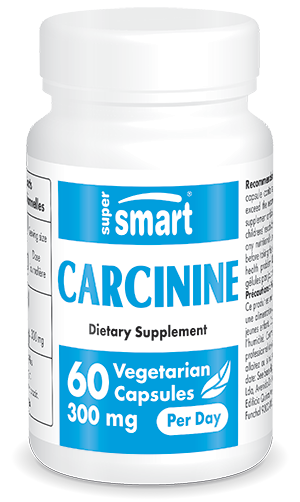 Also known as L-carnosine, carnosine is a peptide formed within the body during the digestion of protein-rich food. It is present in brain and muscle tissue where it actively participates in muscle and tissue contraction. This molecule has also attracted scientific interest for its potential in fighting cellular ageing and glycation. Indeed this is why carnosine has long featured in the anti-ageing and anti-glycation supplements offered in our catalogue. The results of the very latest research into carnosine, Carcinine represents a new response to cellular ageing. It is obtained by slightly modifying the carnosine molecule in order to offer an unprecedented formulation with excellent stability. Like carnosine, carcinine has shown excellent results in fighting cellular ageing. Its anti-ageing effect may be due to several activities within the body. Carcinine may be particularly effective at combatting glycation, one of the key processes responsible for cellular ageing. Glycation is a reaction between a sugar and a protein and leads to the formation of Advanced Glycation End-products or AGE. The formation of these molecules has a negative effect on certain essential proteins, and causes tissue damage to the skin, arteries and muscles, amongst others. As well as accelerating tissue ageing, glycation is also associated with the development of age-related diseases such as atherosclerosis. Fortunately, scientific studies have identified beneficial molecules such as carnosine that are able to counter this process. As mentioned, carcinine is obtained through modification of carnosine and has been shown to be effective at combatting this process of accelerated ageing of the body. Researchers believe it has a number of benefits including anti-glycation, anti-glyco-oxidation and trans-glycation effects. In addition, carcinine seems to have an antioxidant effect which combats oxidative stress and free radical damage. Suffice to say that carcinine ‘ticks all the boxes’ required for inclusion in our wide range of anti-ageing dietary supplements. Not only does carcinine have the same, clear anti-ageing effects as carnosine but it has the advantage of being a more stable form. It is neither degraded by the enzyme carnosinase nor converted into histidine, giving it a longer life in the body and improving its efficacy against glycation. Our new supplement is available in 150mg capsules, with a suggested dose of two capsules a day for maximum benefit, though this can be adapted according to your needs and the advice of your therapist. Other ingredients: talc, magnesium stearate, silicon dioxide, microcrystalline cellulose. adults. Take 2 capules a day. Each capsule contains 150 mg of Glycoxil®.